Catherine buckled Sloane into her carseat and tried to convince Gus to wait and she would buckle his as well. He always wanted to buckle his own seat belt and it took four times as long than if Catherine did it herself. Sloane whimpered and fussed and Catherine fished in her bag for a sippy cup. It still had a little water in it. She handed it to Sloane and brushed some sand she’d missed off the back of the baby’s chubby leg. They’d been at the beach with her sister Michelle and Michelle’s two children Kaylee and Lulu. Michelle was perfect and Kaylee and Lulu, twin six-year-olds with tight braids and perpetually clean shoes were also perfect. Sloane was a sticky mess with her runny nose (teething) and mussed hair. Gus had peanut butter smeared into his hair and she could see she’d missed a spot on his shoulder when she’d been applying sunscreen. Catherine sighed once she got everyone buckled, including herself, and she started the car. She turned on the mind numbing music her children never tired of, Raffi, then turned up the volume. She didn’t want to hear them whine or squabble. Catherine tried to decide what to make for dinner. Once she stopped the car in their driveway, Catherine noticed that Gus and Sloane were both asleep. Her heart swelled with affection for them. They were disheveled and sure to be cranky as soon as they were awakened, but she loved them. Gus woke up fairly easily and staggered into the house, clutching the shells he’d brought back from the beach. Sloane cried but once inside, she also cheered up enough that Catherine was able to unload the car. She gathered towels and the beach blanket and the sandy damp swimsuits and took them all to the laundry room. She threw them in the washing machine and saw there was room for a little more. She picked up a pair of her husband Zach’s jeans from the bottom of the hamper and threw them in too. She heard a small clang when they went in. Curious, she pulled them back out and shifted things around until she saw a little brass key. She wondered what it was the key to. She shrugged and placed it in the small tray she kept on top of the washing machine. That was where she always put loose change or buttons, anything that was stray in the laundry room. Catherine was standing in front of the fridge, contemplating two soft looking pieces of celery, half an onion and three apples. There was a container of sour cream and a half full container of cottage cheese that she didn’t want to open because it was probably moldy. Besides that there was milk and ketchup. Dinner wasn’t looking too promising. She got a text from Zach. He was going to be late. Go ahead and eat, he’d texted. Catherine pulled a box of macaroni and cheese out of the cupboard. She got another text. This one was from Michelle. Did you lose a key at the beach? Found one in our bag. Catherine texted back No, don’t think so. But then there was a knock on the door and Michelle walked in followed closely by James. They were dressed up like they were going out. Michelle’s hair was pulled back in a sleek ponytail and she was wearing white capris and a striped shirt that perfectly accentuated her tan. Catherine was still wearing her swimsuit underneath her sundress and her hair was a mess. Where Michelle tanned, Catherine either burned or was freckled. “But you never lose things,” Catherine said. “I know,” Michelle said, dangling the key in front of Catherine. 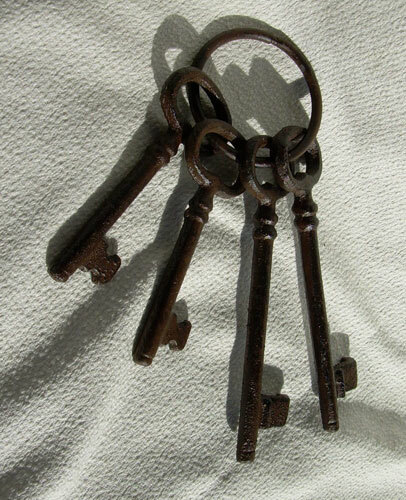 That was weird, Catherine thought, it looked exactly like the other key she’d found in the laundry. “Maybe it is mine,” Catherine said, taking the key. “Yeah,” Catherine said. She walked into the laundry room and picked up the other key. They were identical. Catherine hunted in the kitchen junk drawer for a key ring but didn’t find anything. She did find a shoelace. She looped it through the keys, tied a knot and hung them on a hook. She’d ask Zach about the keys later. She forgot to ask Zach about the keys though. By the time he got home, the kitchen was cleaned up and dark, the children were asleep and she was relaxing with a book. “Sorry I’m late,” he said, bending down to kiss her. The next morning Catherine took the kids to the library for story time. She grabbed the canvas bag she kept just for library books (Michelle’s idea) on the way out the door. She was pulling out the books they were returning and she heard a little clunk inside the bag, peering inside, she saw another key, exactly like the other two. “Yep. It’s in with my dinosaurs. I was going to feed it to them later. I’ll show you. He took his mom's hand and pulled her the direction of his bedroom. Catherine sifted through the herd of plastic crustaceans until she found the wadded up paper resting near the middle. An address was scribbled onto the furrowed parchment in thick slanted letters. Take the elevator two floors and insert the first key into the third door on the left. Catherine wasn’t sure what to make of the note; or who it was even intended for. She gave Gus a forced smile and rushed to grab her phone. She dialed Zach, but the call wouldn’t go through. She stared at the nonresponsive phone until a soft chime told her that she had received a text. There was no recipient listed, and she had no idea what to make of the smily face. Was someone playing a joke? “Not funny,” she said. “What does the note say mommy? What’s not funny?” Gus’ eyes were wide with curiosity and when Catherine didn’t answer him immediately he tugged relentlessly on her pant leg. She didn’t bother explaining anything to her mom when she asked her to watch the kids for a bit. Only that she had an errand to run and wouldn’t be too long. Her plan was to just drive by 1387 Cedar Street and survey the place, but when she pulled up and watched the people going in and out her curiosity got the best of her. On the outside, it looked like an ordinary office space. The lawn was neatly manicured and the windows freshly washed. The revolving doors swung quietly into a large, empty waiting room. A grey haired man sat hunched over a newspaper in the reception area. He looked up for a moment and smiled at Catherine. “Second floor, third door on the left,” he answered before Catherine had time to give her thoughts a voice. Catherine hesitantly pressed the elevator button and waited for the metal doors to slide open. Soft music filled the tight space as she climbed in and Catherine strummed on the wall. The climb to the second floor was taking particularly long and Catherine wished she had just taken the stairs. When the doors finally parted, she eagerly hopped out and looked for the third door on the left. The corridor seemed to go on forever before the rows of doors appeared. Everything seemed so far away all of a sudden. The keys felt cold in her palm as she reached for the lock. She took a deep breath, slipped the first key into the brass keyhole and took a step back. Catherine didn’t know what to expect when she opened that door, but she knew that what was in front of her was not it. She was standing on the threshold looking into what looked like a misty forest. This couldn’t be real, she thought. She stepped in, unsure of what would happen when she entered the room. The door swung shut behind her with a decisive click. Spinning around, Catherine saw that the door was no longer there. In its place was a thicket of dark trees, their moss-covered branches hanging low to the ground. Catherine didn’t know what to do. She took a few tentative steps, thinking that surely she would wake up and find herself laying on her lumpy mattress at home, but with each step she took the dream began to seem more real. Her feet were really walking on spongy earth, she was really smelling lush tropical plants. She was really hearing the foreign sounds of birds calling in the distance. She was really here. Catherine walked a little further in. She saw a curious tree in front of her. It was round and squat, looking almost like a toadstool, but the bark was rough and thick. The top of the tree was covered in a heavy draping of green and purple moss and a pungent smell became clear the closer she got to it. The most curious part, however, was that there was a round little door in the center of the trunk. It blended well into the trunk, so it was not clearly visible from a distance, but she could see it now. In the center of the door was an ornately carved brass door knob with a tiny key hole underneath. “Use your second key, dear,” a voice rasped directly behind her, making Catherine jump. She turned to see an ancient-looking man with long white hair and beard, leaning frailey on a knotted cane. “Who are you?” she cried. The old man stood there for a moment longer before responding, swaying slightly on his cane. “I believe you already know who I am,” he finally responded, nodding with a knowing expression on his face. “I most certainly do not,” Catherine retorted, but then paused. Slowly she began feeling something like a swirling tingle pass through her chest and into her head. “I am one of the three Ancient Origins, the sage of What Could Be,” he almost hissed, coughing slightly on his last word. A shiver ran down Catherine’s spine. Somehow she knew already. “Why am I here?” Catherine stammered, stepping back a little from the old man. With his final statement, the man began to fade away, as if made of smoke. “But wait! What am I to do?” Catherine cried out. She stood there alone again, the remaining two keys in her hands, looking at the mysterious door in the tree. Catherine hunched down and fit the second key into the door of the stump in front of her. She said a quick prayer that she wasn’t going to disappear for good and then turned the ornate brass handle in front of her. She had to squish through the doorway. It didn’t look like this was a passage made for full-grown humans. After entering, she gingerly stood up, hoping not to bump her head. The only light came from the open doorway behind her and that quickly disappeared as the door closed of its own accord. Now what? The air was damp and stale and it felt like she was in a cave. Catherine called out a “hello” to see if she could get a bearing on her surroundings. Her voice echoed back to her. She felt paralyzed. If she inched forward into the darkness, she might fall into an abyss. Or at the very least she would lose contact with the wall and become disoriented. To figure out what to do, Catherine decided to channel Michelle and make a mental list to keep herself organized. Number one: find two more locks for her remaining keys. Number two: complete her quest. And number three: return home. No big deal. Catherine could feel the tell-tale prick in her eyes and the instantly runny nose that told her she was about to break down and cry. Suddenly a light flashed in the room. A flickering image appeared on the far wall of the cave. Catherine breathed a sigh of relief that she now had some idea of where she was--the chamber was not nearly as enormous as she had feared--and then turned her attention to the image. It looked like home movies of when she was a baby. Except these were events where no camera had actually filmed her. She watched as the movies (for lack of a better word) progressed at an incredible rate. Here she was with her mom and dad as a three year old, the vacation to Florida, then her first day of school. Catherine’s life was literally flashing before her eyes and she had no idea how she was processing so much information in such a short amount of time. Too much had happened today already though, that she was done feeling surprised. The movie zoomed to when she was eight years old and had that horrible fight with Michelle. They hadn’t spoken for days afterward. Suddenly a second image flickered next to the first. It contained an alternate reality. Instead of days of not talking, Catherine and Michelle were hugging one another. Catherine’s reality kept hurtling on in the original spot on the wall of the cave. The alternate reality kept up its own story too. Every few seconds, a new alternate reality would flicker on in a different part of the cavern. Some of these imagined life stories were beautiful and some were horrific. Catherine felt herself grow dizzy as she wheeled around looking at all the flashing images on the walls of the otherworldly chamber. And then all the pictures stopped. Directly across from her in the spot where her real life had flashed, Catherine could now see herself stuck in the cave like it was a mirror. She moved closer to herself. In the rock wall was a small lock. Catherine tore herself away from her reality and looked at the next image that had been stopped in time. In this one, she sat on a horse, looking smug. She touched her fingers to her familiar face in the unfamiliar setting and the alternate reality went into motion. She somehow absorbed this new life story in a matter of moments. When it finished, Catherine saw that this image too had a lock under it. She wondered how many alternate realities of her life existed in this place. She spun around and saw that every paused image had a lock underneath it. If she chose a different lock than the one underneath her reality, would her real life be lost? Could she afford to gamble Zach, Gus and Sloane on a fantasy life? Was it really possible she might lose her family if she chose one of the alternate realities? Was she even guaranteed she would have her family back if she chose her current reality and somehow figured out how to get out of this cave? Could she ever even get home again? There seemed to be no guarantees. Catherine tried to remember if she’d seen Zach, Gus or Sloane in any of the movies and she couldn’t remember having seen them at all, including her current reality. Her current movie reality seemed to skip over that aspect of her life. She had seen her mom, dad and sister but not her husband, son or daughter. Why not? Maybe they were a part of each of her realities but they were kept hidden from her. She hoped they had not been there in some of the more horrific realities. There were still too many questions and she did not know what to do. Catherine’s movie started up abruptly and she saw herself in the cave walking over to the picture of herself on a horse looking smug. She watched as she bent down, unlocked the door and went through the door. “I thought that should have been apparent,” said a woman’s voice from directly behind Catherine. Catherine whipped her head around to see a stunning woman dressed all in black standing right behind her. Catherine scrambled to her feet and stared at the lady wondering how she got into this room without making a sound. “Who, who are you?” asked Catherine. “I could try telling you the same thing another way or say my words slower but I rather doubt that would make a difference. Do you have a key, dear?” She said the last question loud and slow and the sound was reverberating off the walls. She held her hand out to Catherine, waiting for the key. “I’m not an idiot,” said Catherine in response to the lady’s obvious dismissal of her intellectual abilities. “I know dear, just use the key and go through the door. On the other side is the reality that should be happening. That’s why I’m here and why you got the keys. Things need to be fixed. It happens way too often but we’ve devised a way to fix it. The life you should have is on the other side of the door. Go through and enjoy,” said the sage. This made Catherine shudder. Some of them were pretty gruesome. The sage continued, “You made some good choices in your life but you got derailed. We’re here to help. Now the key,” said the sage as she gestured toward the door. Then they must be there, thought Catherine. They are three of my best choices ever! “Okay, I’m ready,” said Catherine. “Good, then put the key in the door,” said the sage. Catherine inserted the key and turned the knob. The door swung open and Catherine walked forward and stood in the doorway. “But, then what’s my other key for?” she asked. “You will need it to leave our realm and live out the long life you have ahead of you if you make it past the last sage,” said the sage of What Should Be as she closed the door on Catherine. Catherine walked through the door onto a wide porch. There were red geraniums in pots waving in the breeze and a wind chime tinkled above her head. She was in warm sunlight on what appeared to be a ranch. A large lawn stretched away from the house and in the distance, cattle grazed. Catherine smiled at all she saw. It reminded her of her Aunt Kendra and Uncle Milo’s ranch she loved to visit as a child. She turned around and surveyed the house. It almost seemed like it was Aunt Kendra and Uncle Milo’s house. She hadn’t been there since she was a young girl but this was how she remembered it. There was nothing to do besides knock on the door so Catherine did. She waited a few minutes on the quiet porch. Surely if this is What Should Be, there had to be more than an empty porch. She pushed the door open and entered the inside of the house, dim and cool after the bright sunlit porch. Catherine still had a feeling everything was familiar. The furnishings were different (and she loved everything she saw!) but the rooms seemed similar to Aunt Kendra’s and Uncle Milo’s house. “Hello?” she called, uncomfortable intruding. Was this her house? Where was Zach? Catherine wandered through the house. She saw mail on the table. It was addressed to Catherine Colson. Her maiden name. There was also mail addressed to the Diamond Bar Ranch. That had been the name of Aunt Kendra and Uncle Milo’s ranch. She was sure of it. They had both been killed in a plane crash when Catherine was seven. Uncle Milo loved to fly small planes. The two of them had been out checking on cattle from the sky when somehow the plane had crashed. Catherine pulled a chair out at the kitchen table and sat down. She was lost in thought. She hadn’t thought about Uncle Milo and Aunt Kendra in a long time. Kendra had been her mother’s twin. They were very close. She remembered the sad tears her mother had shed at the time of the accident. She also remembered there had been some sort of anger towards Uncle Milo’s family but she’d been too young to understand the situation. She remembered her father telling her mother that they needed to let it go, it wasn’t worth the feelings of bitterness. A creak on the stairs startled Catherine. Someone was in the house! She stood up from her chair and instinctively faced the doorway. In walked a stooped old woman. She had a walking stick and was wearing a floral print housecoat. “Are you a sage?” Catherine asked. “My name’s Florence,” the woman said in a raspy voice. “You’re home, aren’t you?” Florence said. “Um.” Catherine didn’t know what to say. Catherine thought about that. Yes, they had seemed wealthy. “I didn’t know they’d left me anything.” Catherine said. “So this is my life?” Catherine couldn’t take it all in. There was a knock on the door and Catherine rose to answer it. Before her stood a young man. He doffed his hat and scuffed his boot onto the boards that made up the porch floor. “I’ve irrigated the lower field and Bob told me to ask you if you want the steers moved into the corrals today.” Catherine studied the young man. He was obviously some sort of employee of hers. She had no idea what he was even talking about. “Sure,” she said, hazarding a guess that she wanted the steers in the corrals. “All right,” he said. He stuck his hat back on his head and walked off the porch. He was bow legged and swung his arms as he walked. Catherine turned back to the kitchen and Florence was gone. The first thing Catherine decided to do was tour the house. She loved every bit of it. The leather on the couches was smooth and cool, there was an impressive rock fireplace with the Diamond Bar brand worked into the design. There were several rooms that appeared to be guest rooms and then a room she assumed was her own. There was a sumptuous looking bed and on the dresser there were framed photographs. There was a picture of her parents and one of Michelle with her family. They were standing in front of a beach house. Catherine knew that Aunt Kendra and Uncle Milo’s ranch was in Wyoming. She lived far away from Michelle. Catherine felt decidedly intimidated by one room. It was an office filled with filing cabinets and there were pedigrees of cows spread across the desk. Was she really the owner of a ranch? A breeder of prize Angus bulls? Wait until Zach heard that. She didn’t even want a pet. Zach. Her heart sunk. There was no Zach. No Gus. No Sloane. That couldn’t be true. She would find Zach. Catherine turned on the computer in the office. It was password protected. Without thinking, she typed in PERPLE. It was always her password. She had heard somewhere to pick a common word--so she chose her favorite color--and spell it wrong. Sure enough, the password worked. Catherine giggled to herself, feeling very clever that she had chosen the same password in both realities. She googled Zach Hudson. There were 4,610,000 results. She added Huntington Beach, where they lived. She came up with 350,000 results. She added architect and it bumped back to 599,000 results. (How was that possible?) She scanned through several of the results. None of them seemed like her Zach. Catherine slumped her shoulders. She still had a hard time believing any of this had happened but she also felt very sad. “I don’t want what should have been,” she said to no one. The house was silent. Then she heard footsteps and a tapping of a walking stick. Florence walked in the room. “Where did you go?” Catherine asked. “You said you weren’t a sage!” Catherine said. Catherine just looked at her. She didn’t know what to say. “Do you still have the other key?” Florence asked. “Yes,” Catherine said, she stood and fished it out of her pocket. She pulled out the small key and held it in her palm. “I’m sure,” Catherine said as she strode toward the stairs. She didn’t have to even think about it. She found a little door and fitted the last key into the lock. She stepped inside and exited into a nondescript hallway that seemed to be in an office building. Was she back? Her cell phone in her pocket began ringing. It was her mother. She answered. “You sound almost excited,” her mother said. On the drive to her mother’s house, Catherine dialed Zach. Just to hear his voice.